Carp is wearing both a pinstriped suit and hair in this photo. Just so we’re clear. This bit of news is a few weeks old, but I wanted to share for multiple reasons. One, someone had a chance at, and presumably won, a fishing trip with Chris Carpenter. I wonder if they listened to this before bidding? I mean, seriously, does last off-season’s snake/naked man/excursion deter potential bidders from the four-day charity trip, or encourage them on the chance they might see something even crazier? Second, Carp had plenty to say about his baseball future. Carpenter said he wouldn’t hesitate pitching into his 40s. None of that particularly seems to fit with those expecting Chris Carpenter to ride off into the sunset following the 2013 season, does it? Sure, a difficult season, or another injury, or any other number of variables could discourage Carp from pressing on and make him back off of his comments about going on forever – but if his body holds up? If the health cooperates and he can summon the same willpower that brought him back from thoracic outlet syndrome, and somehow steady the Cardinals into another playoff berth and beyond? I know I’d never doubt a Chris Carpenter that says he wants to pitch in 2014. Or 2015. Or, well, you get the picture. Carp will be 38 in April of 2013. That means “into his 40’s” would require another two-year deal. It’s both exciting and terrifying to me at the same time. 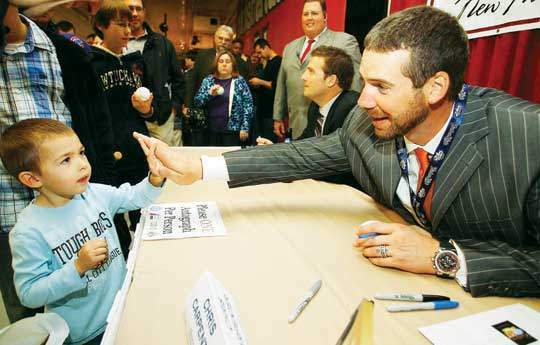 Third, Carpenter’s appearance (along with Wade Boggs, Cecil Fielder, Mike LaValliere, Sam Fuld, and plenty of others) helped to raise a bunch of cash for the Children’s Hospital at Dartmouth-Hitchcock, the Ted Williams Foundation, and the New Hampshire Fisher Cats Foundation. Last year’s event raised a combined $155,680 for Children’s Hospital at Dartmouth, the Fisher Cats Foundation and the Ted Williams Museum. Saturday night’s event was expected to push charitable earnings to about $1 million through the past eight years. Good for Carp, good for everyone involved with this event. I hope he pitches as long as he wants. Out of all the things I did on vacation, one quick internet search would have told me that Carp went to high school in Manchester. That little bit of info would have helped me YESTERDAY! Okay enough beating me up over celebs from NH (Looking at your Sandler). Previous post: Remember Game 6? Relive it by winning Game 6 on Blu-Ray!